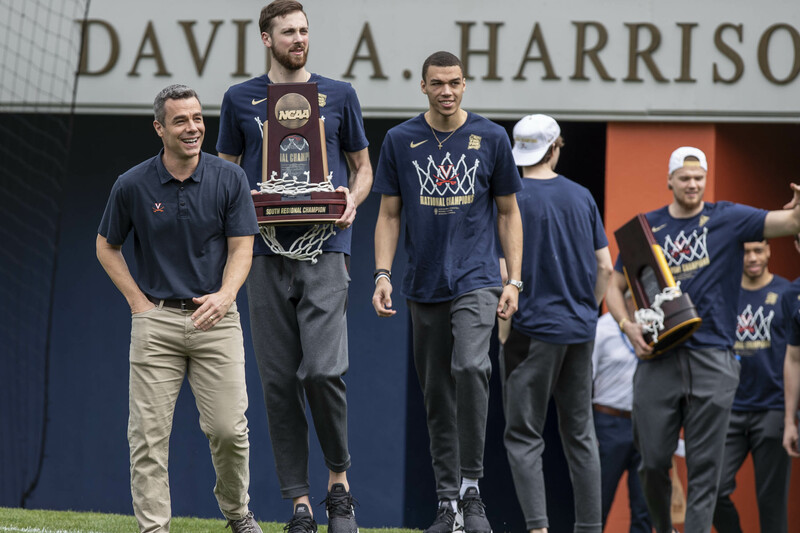 University of Virginia men’s basketball coach Tony Bennett first heard the song – “Stronger Than I’ve Ever Been” – in September, and immediately shared its message with his team. It was a fitting message for a team that fought their way back from a stunning first-round upset last year to this year’s national title game. Before that big game, Frankie Badocchi played the song one last time for his teammates, on a piano in a Minneapolis hotel ballroom. 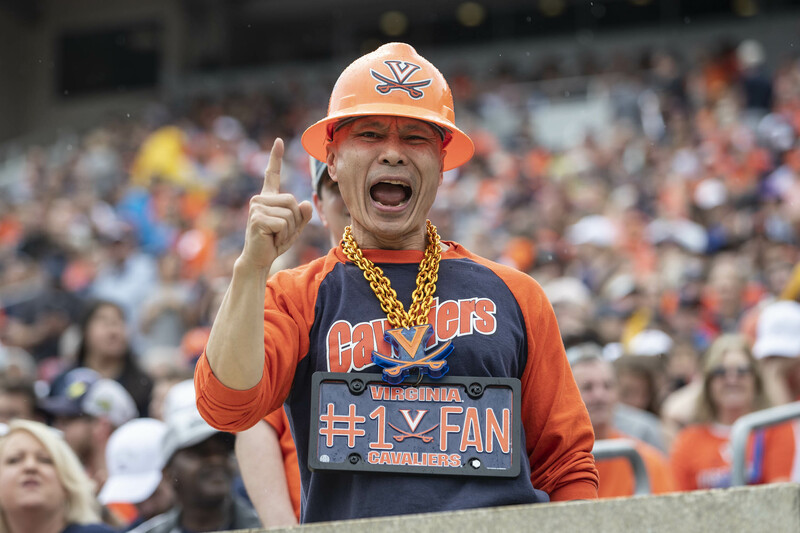 The next time they heard it, they were national champions, and it was playing over the loudspeakers of UVA’s Scott Stadium, where thousands of fans had gathered to celebrate the team and the program’s first national championship. 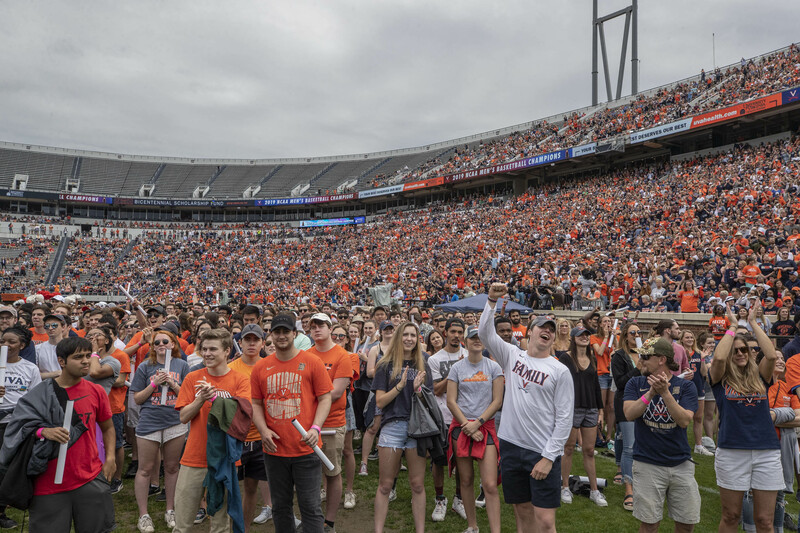 It was a joyful scene, with children in UVA jerseys running around, tournament highlights playing on the video board and huge crowds of fans – many of them sporting brand new national championship gear – filling one side of the stadium, spilling over into the upper deck. On the field, students danced to music blaring near the stage as they waited for the team to come out. 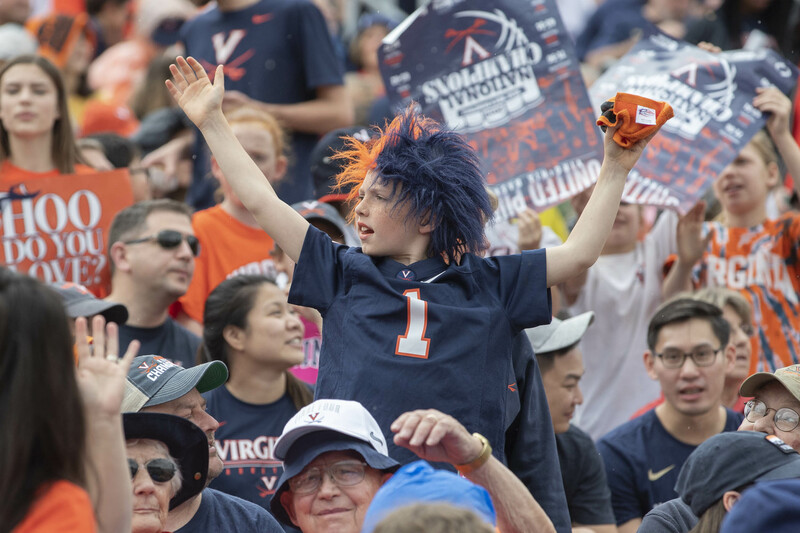 A few yards away, former UVA football star Chris Long played with his small son on the field he once dominated on defense. Bennett, when he led his team out, seemed amazed. 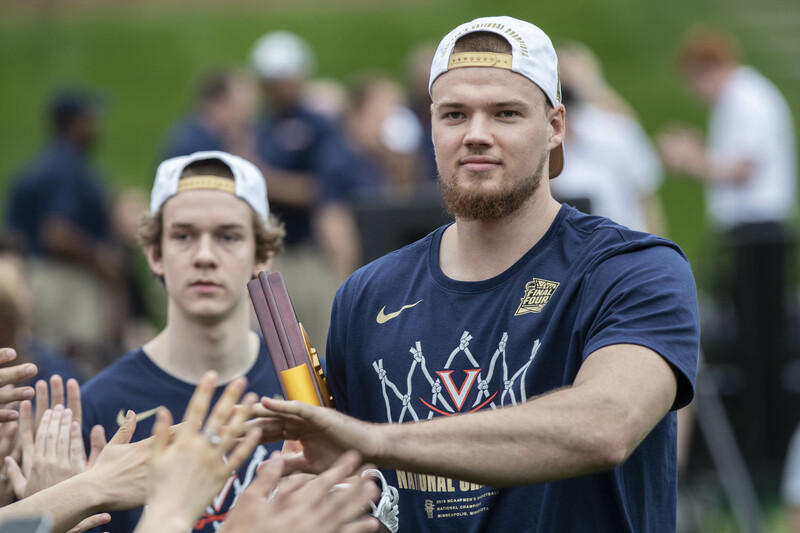 Bennett deflected credit to his players as they assembled beside him on stage, noting that their story – rising from a historic lost to a historic championship – will go down in sports history. 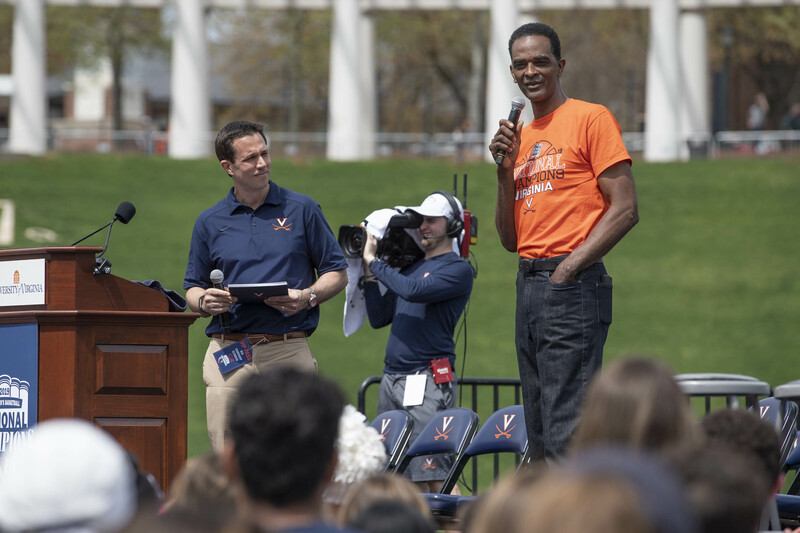 Thousands came to celebrate that story’s happy ending, among them UVA basketball legend Ralph Sampson, who addressed the crowd after attending every game the team played in the NCAA Tournament. He noted that the day marked a special anniversary for him as well. “For this team to come back one year later and be here,” he said. “It’s the best story in college basketball history.” Noting he wore the same pair of tennis shoes to each game, he promised to bring them back next year. 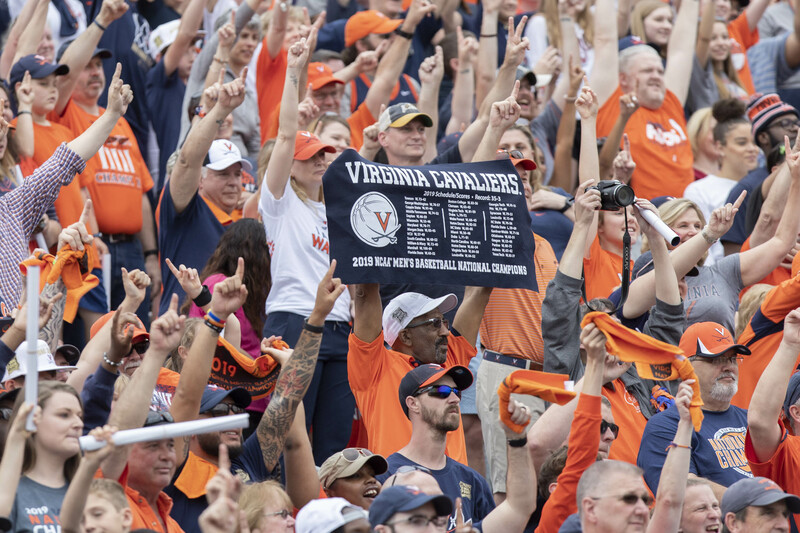 Dave Koehn, the play-by-play announcer for Cavalier radio broadcasts, interviewed several players, each one drawing a huge roar from the crowd as they stood up. Each one of them talked about how much they relied on each other – on their teammates and their coaches – to get to this moment. The players also showed off some hidden talents. 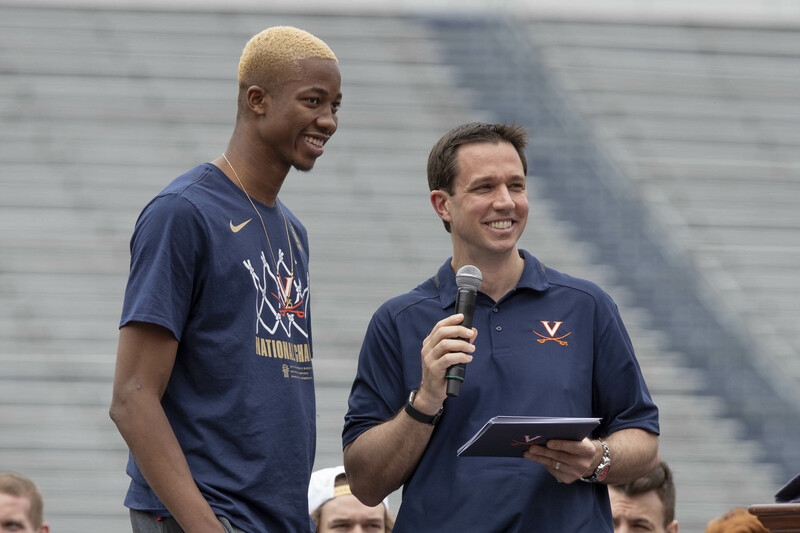 Forward Mamadi Diakite, who speaks five languages fluently, taught the crowd what “national champion” sounds like in Malinke, one of several national languages in his home country of Guinea. Badocchi again sent the team and the crowd off with a song, this time playing the anthem of the NCAA Tournament, “One Shining Moment”. Check out some more photos from the afternoon. 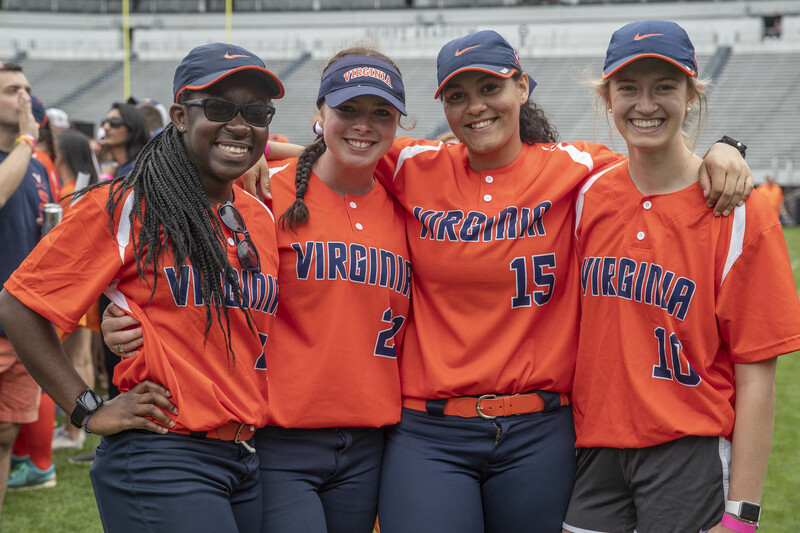 Members of UVA’s club softball team were among the students celebrating on the field. 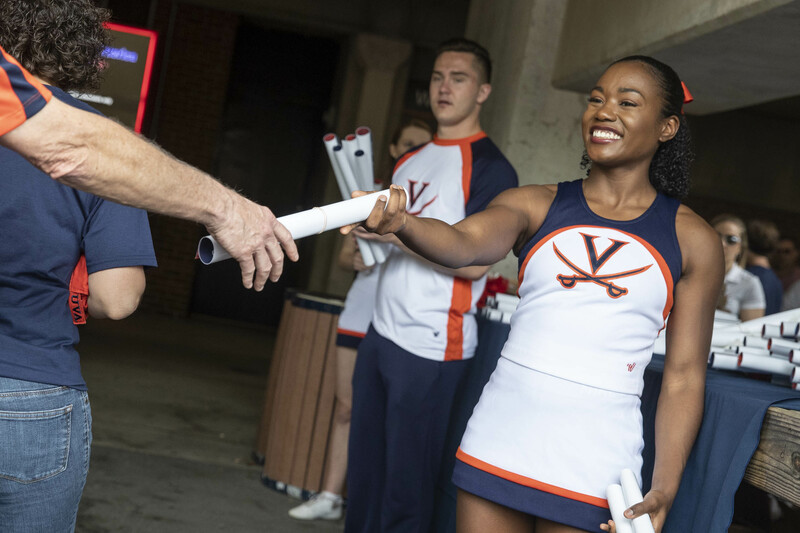 Cheerleader Brooke Burnette was with the team in Minneapolis and handed out hundreds of posters to eager fans on Saturday. 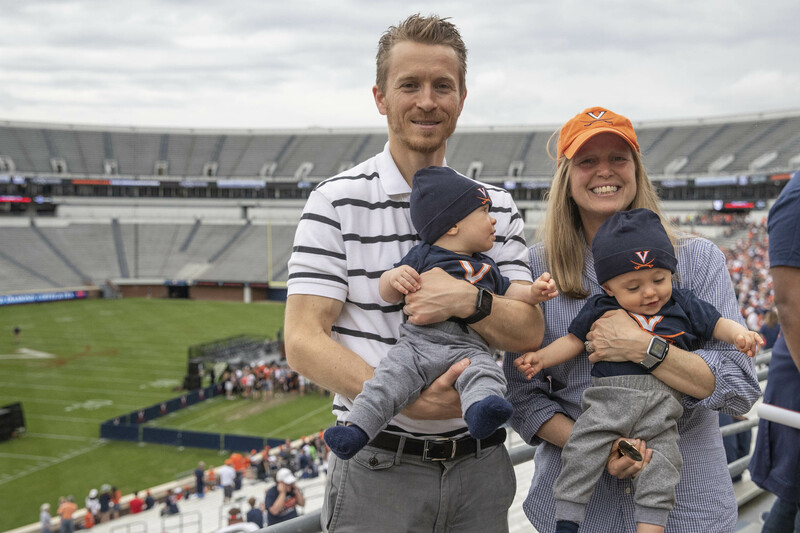 Twins William and James enjoyed their first national championship experience. 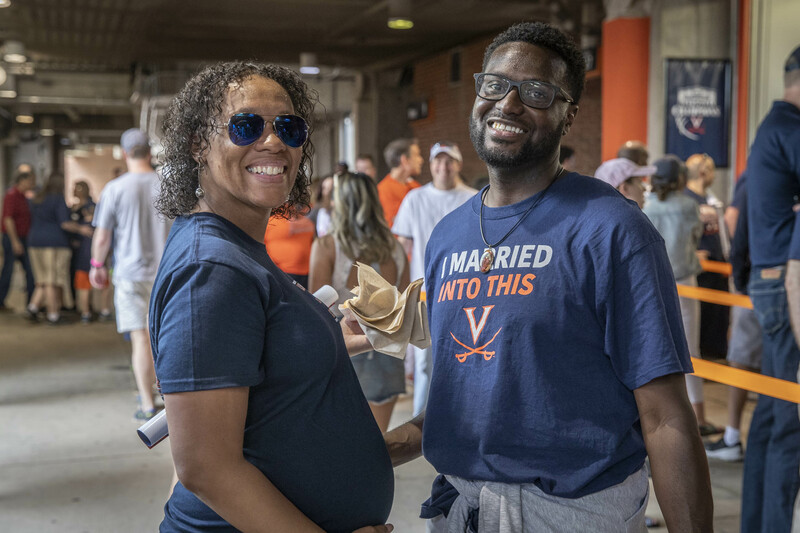 Khalian McLaurin went to UVA; her husband David “married into this.” It looks like their baby – due in June – will be a Wahoo too. 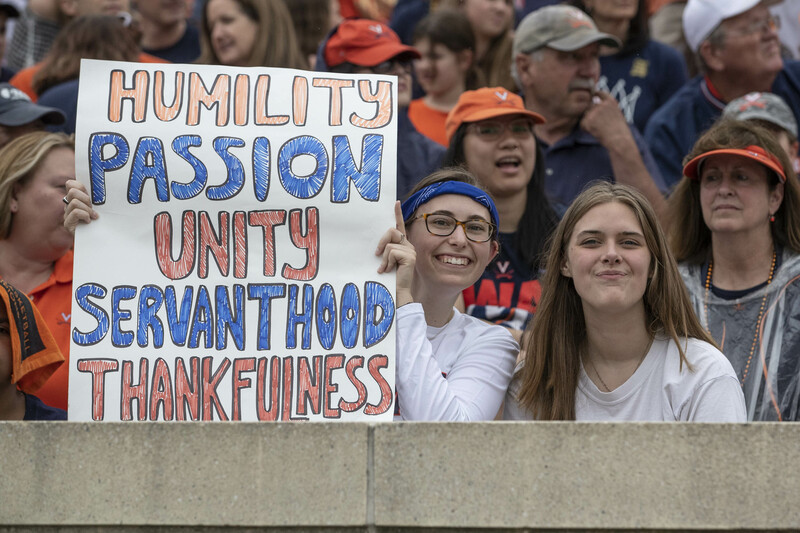 Fans embraced Tony's Bennett's five pillars right along with the team.